Purchasing an ideal mattress these days is easier than ever before with online mattress retailers such as Tomorrow Sleep and Layla Sleep. The Tomorrow Sleep mattress is a 10″ hybrid pocketed coil and foam mattress made up of 4 layers. It comes in 2 firmness options Medium Soft and Medium Firm, and the one we tested is Medium Soft. 1″ Comfort Layer – This layer is 1″ of 4.8lb Visco Elastic memory foam designed to distribute your body weight and provide pressure relief. It is coated with phase-change temperature regulating material that pulls the heat away or keeps it close to your body. 2″ Support / Cooling Layer – This layer is 2″ of 2.5lb gel infused memory foam that provides additional support to your body and reduces heat retention. 6″ Support Layer – This layer is made up of 6″ of pocketed innerspring coils and a 3″ thick ventilated side rail system around the coils that promotes airflow through the sides of the mattress for additional cooling. 1″ Foundation Layer – This layer is 1″ of high-density base foam that serves as the foundation for the coil system. The cover is made from the phase-change regulating material with breathable open weave, and a smooth and soft finish that adds to the comfort and airflow. Tomorrow Sleep comes in two firmness options, and the Medium Soft model that we tested scores 5-6 out of 10, with 10 being the firmest. Its top comfort layer provides a soft luxurious feel, and the underlying coils and foam provide a good support underneath which makes this mattress ideal for heavier sleepers. The Tomorrow Sleep mattress offers good support in all sleeping positions. 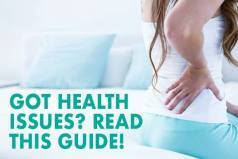 It provides you with enough give in the top comfort layer to support your hips and shoulders, and with enough firmness when you switch to your back or stomach. The Tomorrow Sleep offers a lot of comfort as well. Coils combined with the gel memory foam top layer offer a good push-back and bounce, and provide your body with a nice contour and hug. This mattress is supportive and allows you to sleep soundly in all sleeping positions, while the soft cover keeps you cool and adds to the comfort. The Tomorrow Sleep does a good job in reducing heat due to the gel foam layer in the top comfort layer combined with the phase-change material in the covers. The nature of its innerspring coils allows a good airflow, and perforated edge panels around the coils contribute to this. With the Tomorrow Sleep, sinkage is reduced to the minimum although it is only 10″ in height. The support coils regulate sinking, while the edge support layer incorporated within this mattress provides a good edge support and prevents you from rolling off of the bed. As it is a hybrid coil mattress, it has a certain degree of motion transfer, but nothing too extreme like it is the case with some competing beds. The Tomorrow Sleep gets high marks for not having any noticeable smell upon opening the box. Hybrid coil/foam construction of this mattress minimizes the degree of off-gassing that all foam mattresses usually have. American made at the Serta manufacturing facility. The Tomorrow Sleep is very reasonably priced, and you can get a Queen size for $865 after clicking here and using our $125 off code: MFT125. This is an excellent price given the quality of materials used in this mattress. Click here to read the full Tomorrow Sleep mattress review. The Layla is an all-foam 10-inch mattress with 4 layers of copper-infused memory foam and base support foam. 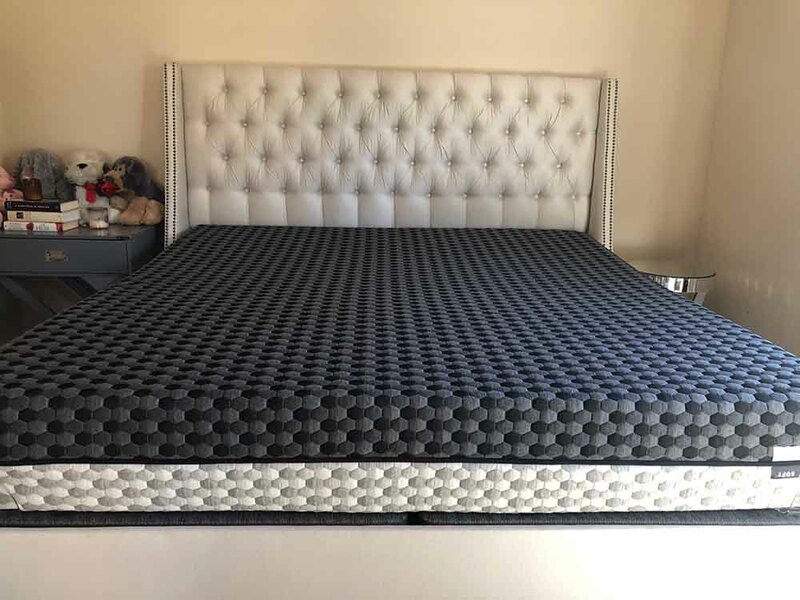 There is a core inner support foam layer and a comfort layer on each side of the mattress, which provide the different firmness settings when the mattress is flipped over. 4″ Base Support Foam – 4″ of 2.o ILD Poly Base foam that provides overall support for the mattress in both comfort configurations. 1″ Comfort Layer (Firm setting) – 1″ of the same high-density copper infused memory foam as 3″ layer. The cover is soft and comfortable, lined with THERMOgel technology that causes the bed to react to your body’s sweat in order to keep you cool at night as well. Besides this the cover is colored differently on each firmness side of the mattress, and both soft and firm side are clearly marked. This mattress is unique in that you can go from a soft feel to a firm feel in the same bed simply by turning the mattress over. We felt the soft side to be around a 5-6 on the firmness scale, with 10 being the firmest. When we flipped it over to the firmer side the feel was around 8 out of 10, with 10 being the firmest. The mattress does a great job at supporting both my lighter weight and the heavier weight of my partner without the feeling of being trapped in foam. 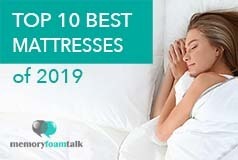 It is a universal model that will satisfy just about all firmness preferences of the sleepers, from those that like the softer/medium feel to those wanting the firmer one. As for the comfort, the Layla mattress is a rather comfortable as it can satisfy both softer and firmer preferences of the sleepers and provide them with a luxurious feel. Its soft cover and the all foam construction on the soft firmness allow you to sink in the mattress to a certain degree but not feel trapped. Similarly, if you prefer a firmer mattress, you just have to flip it over and you will be provided with a firmer comfort level. The Layla does a great job at sleeping cool, and it is far above almost every other mattress on the market in this category. All foam beds usually lead to the build-up of heat and the feeling of stickiness, but with the Layla, there is no such problem due to the use of copper-infused foam in its construction. The THERMOgel infused cover contributes to not sweating when sleeping as well. Sinkage and motion transfer depend on which firmness level you prefer. As sinkage is largely weight dependant, Andrew sunk down more on the softer side than I did, but this is something he enjoys as he prefers the feeling of his body being contoured in foam which helps support his back and shoulders as well. A firm side of the mattress causes less sinkage and the edge support is also better on the firm side than on the soft for the same reason. The Layla has a good edge support and Andrew did not compress or sink down to the foundation as it often happens with other memory foam mattresses. When it comes to motion transfer, it is almost non-existent with Layla both on its soft side as well as on the firm side, which is a great benefit for couples. The Layla releases a minimal amount of smell upon opening of the box, which is quite surprising given the fact that it is an all-foam mattress. All the smell that is present dissipates within a few hours. The Layla is very competitively priced at $899 for a Queen ($799 with our exclusive $100 off coupon). This is an excellent price given the quality materials used in the construction of this mattress and its special cooling features. Click here to read the full Layla mattress review. Below is our comprehensive side-by-side comparison of the Tomorrow Sleep vs. Layla mattress. Memory foam feel – Memory foam top layer of this mattress provides a good contour to your body and gives you a feeling of hug typical for classic memory foam. 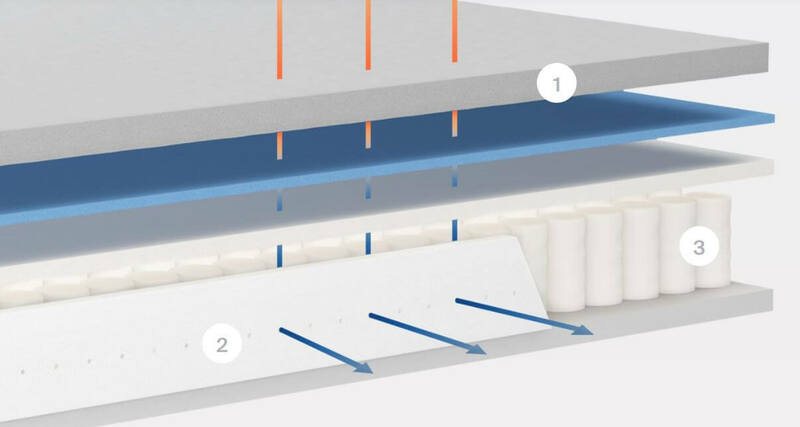 Breathable mattress – The innerspring coil layer and aerated side support layer allow excellent airflow through the mattress while the gel foam layer in the top comfort layer and the phase-change material in the covers reduce heat retention. Mattress with bounce – The support layer made of a pocketed coil system provides a good degree of bounce and prevents sinking too far through memory foam layers. Sharing your bed – The Tomorrow Sleep mattress performed well on the motion transfer test, and it is a good choice if you plan on sharing your bed with a partner as your sleep will not be disturbed by shaking of the mattress when changing positions with your partner or getting in and out of bed during the night. Memory foam feel – Both the firm and the soft sides of the Layla contain copper infused memory foam that provides pressure relief. 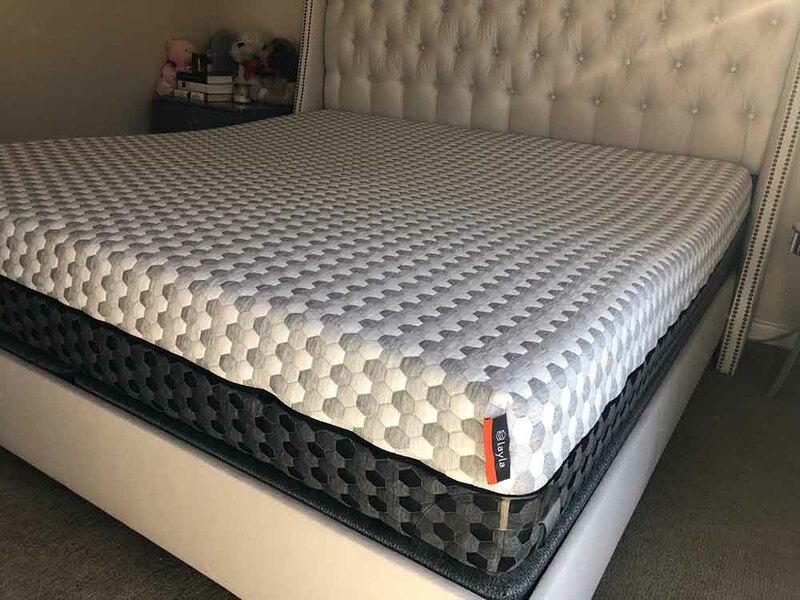 Its soft cover and the all foam construction allow you to sink in the mattress to a certain degree and provide you with the classic memory foam feel of contouring without the feeling of being trapped. Sleeping cool – The THERMOgel infused cover of this mattress and the use of cooper-infused foam in its construction prevent heat build-up, regulate the temperature and eliminate the sticky feeling that most all-foam mattresses cause. 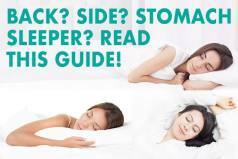 Adjustable mattress – The Layla could be an excellent choice for you if you are not sure which firmness level is right for you as it gives you the possibility to go from a soft to a firm feel in the same bed simply by turning the mattress over. Sharing your bed – The Layla mattress due to its all-foam construction causes very minimal motion transfer when changing positions or getting in and our of bed during the night, and it can be a great choice if you plan on sharing your bed with a partner.